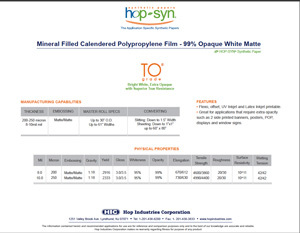 Hop-Syn® TO is an extra opaque, tear-resistant synthetic paper made from a unique mixture of calcium carbonate and polypropylene resin. Manufactured by calender into a single layered substrate, our TO grade is made with additional whitening agents and fillers to improve its sheet brightness up to 94% and opacity up to 99%. With a high dyne level and smooth matte finish, our TO grade has the printing performance that you would expect from a fine offset paper but with the extra opacity that would help prevent reverse side images from showing through in window signs and well lit retail applications.